Preparing for the Dance of Death food event, I’ve been compiling my long grocery lists. A friend, who has a membership to the Restaurant Depot offered to take me for my first trip to help me stock up. 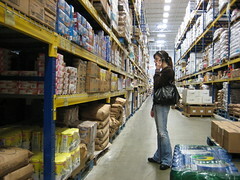 The Restaurant Depot, an overwhelming warehouse selling bulk foods to members of the food industry, features isle upon isle of 5 gallon buckets of thousand island dressing to cases of 10,000 cocktail umbrellas. My first trip was exciting, yet daunting. My friend, wisely ushered me through the stacks, to select all my goods as quickly as possible, knowing otherwise, I would have been there for hours staring at the 25 foot tall wall of cheese wheels. I loved Chick Pea Pie’s Flickr photo and caption, as I was tempted to do exactly the same thing! !